This critic, for those who might not know, is a parent and is married. It makes finding time to go through everything needed difficult at times. It also means trying to find ways to keep a child entertained quite often. Keeping a child entertained includes finding DVDs and Blu-rays that will entertain and educate at the same time. Thankfully, that part of doing this job is not too difficult, as companies, such as Public Media Distribution, Film Movement and Shout! Factory Kids have offered again this year, plenty of options. Those options include, and are not limited to two new (and seemingly the last) Transformers Rescue Bots DVDs, two more fun-filled collections of episodes from Nature Cat and more new material from Wild Kratts and Dinosaur Train. Of course that new material is just some of the fun new fare offered for families this year. Film Movement’s release of The Railway Children live is a welcome new take on a stage presentation that also honors its literary source material, and Nickelodeon’s long-awaited Hey Arnold: The Jungle Movie is a bit of a disappointment, but still worth at least one watch thanks to some major writing problems. 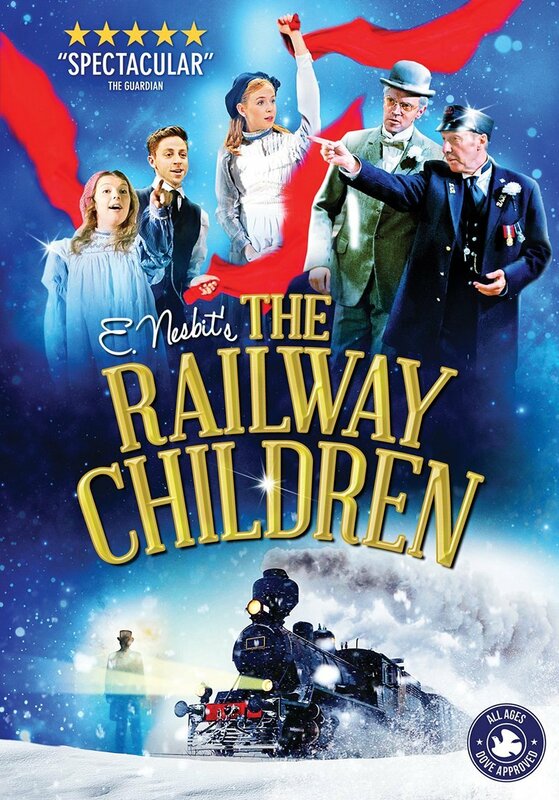 The top spot in this year’s Top 10 new Family DVDs/BDs list goes to the noted stage adaptation of The Railway Children. This adaptation honors its source material while also presenting a one-of-its kind stage presentation that is unlike almost anything that American audiences have ever seen from stage plays. The number two and three spots on this year’s list go to Public Media Distribution’s two new Nature Cat DVDs, Onward & Pondward and Winter Dance Party. Each DVD’s episodes follow a specific theme while also teaching lessons that are directly linked with the themes. Also included in this year’s list, as noted already are the new Wild Kratts DVDs and those from Transformers Rescue Bots along with the new Hey Arnold! movie, just to name a handful of titles. As always, the top 10 pics are the best while the five that follow are honorable mention titles. Without any further ado, here is Phil’s Picks 2018 Top 10 New Family DVDs & BDs list. Transformers Rescue Bots officially called it a wrap last year after four full seasons on Hub/Discovery Family Channel, and while the series – which is now the longest-running series in the Transformers franchise – is officially done, not all of the series’ episodes have been released on DVD as of yet. Two more DVDs featuring a total of ten more episodes have been released jointly this year via Hasbro Studios and Shout! Factory Kids. The first, Outdoor Adventures, was released January 30, and it is another enjoyable addition to any Transformers fan’s home DVD library. That is proven in part through the DVD’s episodes. This will be discussed shortly. The stories presented within the episodes add even more interest to the DVD and will be discussed a little bit later on. The DVD’s average price point rounds out its most important elements. When it is considered alongside the episodes and their stories, the end result is a DVD that is another enjoyable collection of Transformers Rescue Bots episodes and thankfully not the series’ last. Transformers Rescue Bots: Outdoor Adventures, the first of two new collections from the longest running series in the history of the Transformers franchise, is an enjoyable new addition to the series’ Thankfully it is also not the only of the series’ episode collections to be released this year. For the sake of this review, the focus will remain on this collection, though. One of the items that make this collection so enjoyable for audiences is its episodes. The episodes all follow the common thread in its title, Outdoor Adventures. The disc’s lead episode, “The Riders of Midwinter” sees the Rescue Bots having to brave some snowy weather in order to help one of Griffin Rock’s citizens deliver warm bread to everybody as part of the island town’s annual winter celebration. “Phantom of the Sea” takes the Rescue Bots onto a high seas time traveling adventure that also presents a love story that reaches across the ages. The ocean theme continues in “Turning The Tide” as the Rescue Bots are introduced to one of Optimus Prime’s old friends during some high seas rescue training. Again, there is that outdoors theme, and in its own original presentation. “A New Hero” sees a young, impetuous Autobot head into not just the outdoors, but outer space in the second half of a two-part story arc. The story arc in question follows the “new recruit” as he has to learn his own tough lessons. ‘Endangered Species’ takes the team to the forests of Griffin Rock to protect a group of endangered birds from a bunch of overzealous birdwatchers whose interests are their own, not the birds. Once more, audiences have another outdoor adventure in another setting different from the DVD’s other presentations. This shows even more why the episodes in whole are so important to note in the DVD’s overall presentation. Each episode follows that common thread of the outdoors, just in its own original fashion. That in itself gives audiences something to appreciate. It is just one of the elements that makes the DVD a welcome addition to any Transformers fan’s collection. The stories within the episodes are just as important to note as the episodes. The stories are so important to note because each presented a plot separate from one another and because of their overall content. The disc’s lead episode is an original holiday-themed story that is unlike pretty much any other holiday themed TV show’s episodes past or present. It’s not just another story focusing on someone saving Christmas because something happened to Santa. It’s a story about family and friends, and about tradition that also sees the Rescue Bots grow as characters even more. While there is plenty of heartfelt feelings throughout the story, there are also some fun jokes that will put just as much of a smile on audiences’ faces as the story’s more heartfelt content. Things take a distinct turn from there as the compilation progresses into “Phantom of the Sea,” which sees the Rescue Bots go on a time traveling adventure with a little bit of romance. The story is centered on a Griffin Rock legend about a “phantom” ship that appears at certain times just off the island’s coast. In other words, it’s a little bit of sci-fi and a little bit of romance, so it is completely separate in its own way from the rest of the collection’s stories. The addition of a certain familiar character’s influence in the story adds even more interest to its whole. “Turning The Tide” presents invaluable lessons about teamwork, friendship and loyalty as the Rescue Bots meet one of OP’s old friends, and again it is a story that does not repeat at all any of the themes in its counterparts in this collection. “A New Hero” reminds audiences that sometimes, tough decisions must be made in life and we have to get over ourselves through Blur’s own personal journey of self-discovery. Once more, audiences get here a deep message presented in an accessible and original way at least in the bigger picture of this series. To that end, it’s even more interesting and welcome to the whole of the DVD’s presentation. “Endangered Species” presents its own original story that presses the importance of caring for our environment without being preachy in the process. It does this through the process of Boulder discovering a family of birds whose species was thought to be extinct. The result is that a bunch of overzealous individuals (including the town’s self-centered mayor – who is a great caricature of real world politicians) descend on the town and nearly destroy the birds’ home because of their own selfishness. They weren’t respecting the birds, but rather caring about their own selfish interests. It’s a key lesson that, again, is not preachy in its delivery, but hits home and does so hard. It’s also original not only in comparison to the rest of the collection’s episodes, but in comparison to so many other stories out there. There might be similar stories from other shows out there, but odds are, few are so much like this one. Keeping that in mind, its originality makes for even more proof of the importance of the collection’s stories. It’s just one more original story that, when joined with the rest of the collection’s original stories offers even more for audiences to appreciate in this collection. When this is considered along with the fact that the episodes all follow one common thread from first to last, it makes the collection even more impressive. Of course, these two elements together are still not all that makes the DVD a welcome addition to any Transformers fan’s collection. The DVD’s average price point rounds out its most important elements. The average price point of Transformers Rescue Bots: Outdoor Adventures is almost $11. That is found using prices from Amazon, Target, Best Buy and Shout! Factory. Extensive searching for the title from Wal-Mart turned up nothing on the DVD. Considering that the DVD’s run time is just short of two hours (110 minutes total according to the listed run time), that price is not too bad. So many DVDs from other studios with less content are far more expensive. It still leaves one wishing that Shout! Factory would make a deal with Hasbro Studios to release each of the series’ four seasons in their own standalone sets or the series in whole. It might be a little more expensive than the average price of one of the show’s compilation DVDs, but considering the following that the series built over four seasons and that so many episodes still remain unreleased, odds are audiences would pay the money for full season sets or a full series set. Until then though, paying an average price of $11 for nearly two hours of content is not a bad price to pay. That is proven through the content in the DVD’s stories and the continuity in the episodes featured in the disc. Keeping all of this in mind, Outdoor Adventure still proves to be another welcome addition to any Transformers fan’s collection. Shout! Factory Kids teamed up late last month with Hasbro Studios for yet another collection of Transformers Rescue Bots episodes in the form of Transformers Rescue Bots: Rescue Family. The single-disc compilation culls five more episodes from the animated Discovery Family series that the whole family will enjoy. That is due in part to the episodes themselves. This will be discussed shortly. The stories within the episodes are collectively important to the collection, too and will be discussed later. It is not the last of the collection’s key elements either. The disc’s average price point rounds out its most important elements. When it is considered along with the collection’s episodes and their stories, the whole of the collection proves to be yet another of this year’s top new children’s DVDs. 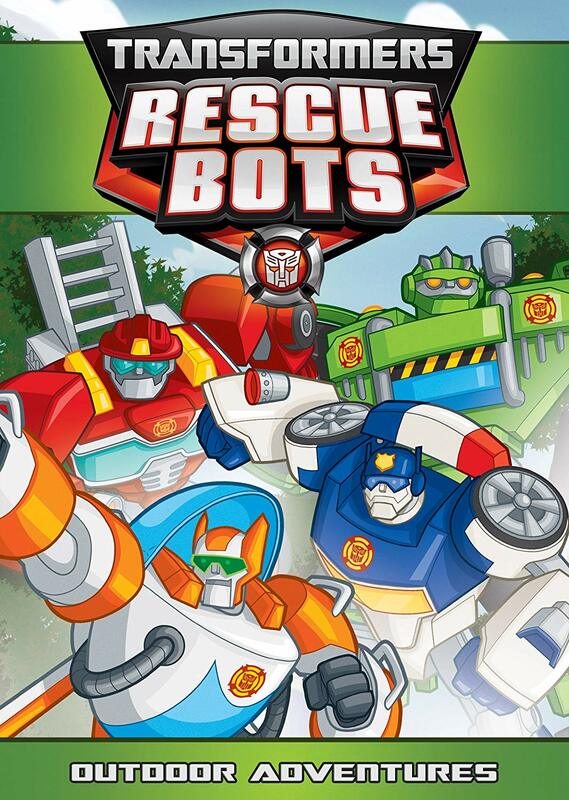 Transformers Rescue Bots: Rescue Family is one of this year’s top new children’s DVDs. It is a collection that children will enjoy just as much as grown-ups. That is due in part to the episodes culled for the collection. Five episodes from the hit animated Discovery Family series were collected for this collection, which has remained the standard for every one of the series’ previously released collections. 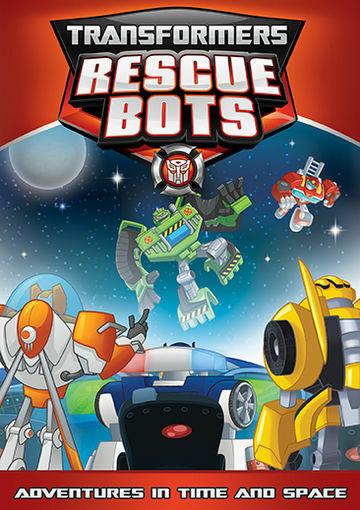 The episodes – ‘Road Trip,’ ‘Prescott’s Bots!,’ Odd Bot Out,’ ‘Chief Woodrow’ and ‘More Than Meets The Eye’ – were pulled from the series’ second and third seasons. The first three episodes were pulled from the series’ second season, and the last two from its third season. This collection is not the first of the series’ DVDs to feature episodes from multiple seasons. However, that its episodes were pulled specifically from those two seasons rather than randomly across the board presents a clear focus in the episode choices. The episodes featured in Shout! Factory and Hasbro Studios’ latest Transformers Rescue Bots DVD Rescue Family are clearly important to the disc’s overall presentation. That is proven through the focus placed on the seasons from which they were lifted. While the episodes are clearly important, they are not the collection’s only important collective element. The stories within the episodes are just as important to the collection’s presentation as the episodes themselves. That is important to note because while they do bring back in some familiar secondary characters, the stories themselves do not repeat any of the episodes that came before or after. “Chief Woodrow” is a key example of this statement. Chief Burns’ brother Woodrow returns once again in this episode, except this time the trouble happens not beneath the island but on the island as Chief Burns is away at a Police Conference. Woodrow (who is once again voiced by Mark Hamill – Star Wars, Batman: The Animated Series) ends up being named acting police chief after he saves the mayor, leading to even more trouble. Lead episode “Road Trip” exemplifies that statement just as much as “Chief Woodrow.” This episode’s story is yet another that is centered on trouble caused by Doc Greene’s inventions. This time out, Doc Greene has developed a transporter a la Star Trek (rather fitting since Levar Burton made his fame on Star Trek: The Next Generation). The problem is that the transporter turns out to be a one-way transporter, rather than a two-ray device. This leads to its own share of problems for Cody and the Rescue Bots. Meanwhile Kade has to be rescued by a paramedic named Taylor after the pair crash-land in the forest while Taylor is hang gliding. Both of these story lines are original to the series’ history, showing again the importance of the stories presented in each episode. The story line presented in “Odd Bot Out” is yet another example of that importance. Blades’ infatuation with Bumblebee comes to the fore yet again in this story. But instead of the pair working together to save Griffin Rock, Bumblebee works with Dani on a top-secret mission, leaving Blades the proverbial fifth wheel of sorts. The reason they end up partnering is that Dani’s pilot’s license expired and she has to get it renewed. Meanwhile sinkholes start appearing all around the island, threatening to sink the island thanks to Madeline Pynch activating an ancient technology below the waves just off of the island’s coast. Given, it’s not the first time that the writers have had Griffin Rock’s residents threatened by a potential sinking of the island. But the way in which the writers handled this matter did keep the story from just re-hashing its predecessor’s story. Keeping that in mind, this story line is still another example of why the stories presented in this collection’s episodes are just as important to the disc’s overall presentation as the episodes themselves. The stories at the center of Transformers Rescue Bots: Rescue Family are clearly integral to the collection’s overall presentation. That is evidenced through the stories discussed above. Keeping that mind, the stories are not the last of the set’s most important elements. The disc’s average price point is just as important to its presentation as its episodes and their relative stories. The disc’s average price point between major retailers Target, Wal-Mart, Best Buy and Shout! Factory’s own online store, comes to approximately $10.35. Considering that the disc’s five episodes present a total run time of 110 minutes (1 hour, 50 minutes), a roughly $10 (plus tax likely) price tag is not that bad. That is especially considering other discs with just as many episodes from other series and companies are nearly twice as expensive. Keeping this in mind, it becomes clear why the average price point for this collection of episodes is important to the collection’s presentation as its episodes and their stories. When it is joined with those elements, the whole of the elements makes this disc a grouping that is both enjoyable and cost efficient. In turn, it becomes a collection that is deserving of plenty of applause and of being placed on any critic’s list of the year’s top new children’s DVDs. 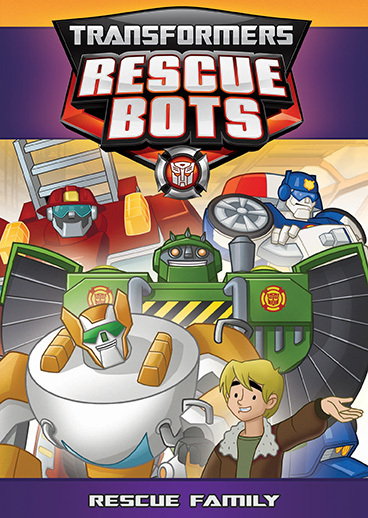 The Rescue Bots are rolling to the rescue once again this summer with a brand new collection of adventures on DVD. It comes in the form of Transformers Rescue Bots: Heroes of Tech. The brand new DVD will be released in stores and online next Tuesday, June 21st. Just as with the series’ previous DVDs there is plenty to appreciate about this latest release beginning with the episodes themselves. They all follow one consistent theme throughout the course of the disc’s nearly two hour run time. This is just one of the disc’s key elements. The writing within the episodes is just as important to note in the episodes’ presentation as the episodes themselves. Last but definitely not least of note is the work of the show’s cast once more. That is especially the case in the musical episode “I Have Heard The Robots Singing.” The cast’s work rounds out this set’s most notable elements and completes its presentation. Each element is important in its own way to the overall presentation of Transformers Rescue Bots: Heroes of Tech. Altogether they make this set yet another welcome piece for the series’ fans of all ages. Transformers Rescue Bots: Heroes of Tech is neither the first nor the last collection of episodes to be released from Hasbro Studios and Discovery Family. Keeping this in mind it is yet another welcome collection for the series’ fans regardless of age. The central reason for this is the set’s episodes. Audiences will note that all five of the disc’s featured episodes follow the exact same theme—technology. Each episode sees the Rescue Bots—Blade, Chase, Boulder, and Heatwave—having to save the day because technology has caused some sort of havoc in one way or another. This is so important to note because it is not the first time that one of the series’ collections has managed to follow one collective theme. This has been done with previous collections from the show, too. There are lots of children’s series out there that have seen multiple DVD releases, too. The thing of those sets is that not all of them present episodes that follow the sets’ titles. Considering this, and the fact that it is not the first time that Shout! Factory (and Shout! Factory Kids) have succeeded in this avenue, it makes this element all the more important to this set’s presentation. Now, having noted all of this, it becomes clear why the episodes presented in this collection are so important to its presentation. Of course the episodes are collectively just one of the set’s important elements. The writing behind the episodes is just as important to note as the episodes themselves. The episodes that are presented in Shout! Factory’s (and Shout! Factory Kids’) new Transformers Rescue Bots collection are in their own right hugely important to the set’s presentation. That is because they each follow one continuous theme from one episode to the next. That seems at least somewhat rare in today’s overcrowded field of children’s DVDs. It is just one of the important elements of the set’s presentation. The writing behind these episodes is just as important to the set’s presentation as the episodes themselves. This applies both to the episodes’ stories and their smaller elements. In regards to the episodes’ stories audiences will enjoy the adventures on which the writers send the Rescue Bots and the Burns family. “Space Bots” is a prime example of this. This episode sees Doc Greene and Graham take a space station of sorts called the Asgard into space. The Asgard doesn’t just launch into space either. It uses a space elevator of sorts in order to reach space. It isn’t the space elevator that has been conceptualized in real life by any means. But the fact that the episode (which isn’t the series’ only episode to feature the Asgard, either) incorporates a very real life concept at its base is impressive. That the writers would also incorporate the equally real danger of asteroid strikes into the story makes it all the more entertaining and engaging. It is just one part of what makes the story such a prime example of the importance of the set’s writing. There are other elements thrown into the story that are just as impressive. Those will be left for audiences to find out for themselves. “The Island of Misfit Tech” is another key example of the importance of the writing in these episodes. This is evident right from the episode’s title, one of its smaller elements. The title is a play on the Island of Misfit Toys, from Rudolph The Red Nose Reindeer. The story itself is just as important if not more so. This story sees the Burns family joining Doc Greene on the highly classified island as they look for Cody. They are hunting for Cody because he has inadvertently been taken there by a mechanical bull that has shorted out. In the process, the bull got his jacket, which also had his communicator, thus leaving him unable to communicate with the team. This is ultimately what leads the team to venture to the “island.” What is interesting about the whole thing is that the bull that causes the whole mess just happens along at the story’s outset. This is notable because while it seems like this isn’t much of a setup, it actually works, and does so quite well surprisingly enough. Considering all of this, this story is one more way in which the writing shows to be so important to the set. The epiphany presented at the end (which will be discussed later) proves that even more. It still is not the last way in which the stories in these episodes prove so important in the episodes’ writing. “I Have Heard The Robots Singing” is yet another example of what makes the episodes’ writing so important. The stories that were crafted for ‘The Island Of Misfit Tech” and “Space Bots” are clear examples of the importance of the episodes’ writing. They are not the only episodes that can be cited in explaining its importance. “I Have Heard The Robots Singing” is another example of the importance of the episodes’ writing. This episode is a nearly full on musical episode, save for a few minutes in the episode’s opening scenes. It is not the first time that any show has gone the musical route. There has been a handful of shows for grownups that have gone this route over the years. But in regards to children’s shows it is one of the very few shows that has gone that route, if not the only one. That aside, it is the first time that the series has ever taken the musical route, though. So at least to that extent the writers are to be applauded. The approach taken within the episode (its smaller elements) add even more to the episode. That will be discussed shortly. The story’s setup is what makes the writing here so impressive in the bigger picture. It is caused when one of Doc Greene’s inventions is stolen by Priscilla Pynch. Doc Greene’s reason for building the machine leads to a message within the story that is just as important to the story as the story itself. It is another of those smaller elements that solidifies the writing’s importance even more and will be discussed later. All things considered, all three of the stories noted here are clear examples of why the writing behind these episodes is so important to the set’s presentation. And it is hardly the last example, too. “Too Many Kades” presents a familiar story line (at least in the realm of animated series) when Kade is cloned multiple times over by yet another of Doc Greene’s inventions. Each clone presents a different part of Kade’s personality. They also cause their own share of confusion among the team’s members until the truth is revealed and they have to get all of the clone Kades back together. The story presented in “One For The Ages” is just as familiar. It sees Cody accidentally turned into a grownup by yet another of Doc Greene’s devices. This is a story line that has been used so many times before by so many other series. But again, it is the writers’ approach that makes it original here. And yet again there is a message in this episode, too that strengthens the episode’s writing even more. Whether through this story or any of the others noted here, it becomes entirely clear why the writing behind the episodes is just as important (at least in regards to the stories) as the episodes themselves. The stories are however, not the only way in which the writing proves so important to the set’s presentation. The smaller elements incorporated into the stories are just as important to note as the stories themselves. The stories that were crafted for each episode in Transformers Rescue Bots: Heroes of Tech are in their own right key to showing the importance of the writing in the episodes. They are however just the tip of the iceberg in doing so. The smaller elements of the stories are just as important to the writing as the stories. This includes the deeper messages of certain episodes, the dialogue incorporated into the episodes, and even certain other elements. One moment in which the smaller writing elements prove entertaining comes in “The Island Of Misfit Toys.” Right off the top the writers make a sports joke when Cody announces that he didn’t make the soccer team. Heatwave very bluntly asks, “Is soccer the one where they run back and forth across the same patch of grass?” Boulder responds with an almost inquisitive tone, “I think that’s called football.” The way in which Heatwave poses his question hints at a sense of what most people think makes soccer (or football) boring. It’s so subtle but such a great moment. Boulder’s response is just as funny because it addresses the cultural diversity in terms of what the western world calls the sport versus what the rest of the world calls it. The subtlety of the joke and the fact that the writers could actually incorporate two jokes into such a short moment makes it even more enjoyable. It is even complimented right off the bat in “Too Many Kades” as the Burns family is playing basketball. Blades asks Chase about the game saying, “Okay, explain to me again. This is football?’ Chase responds in the moment, “No actual feet are involved. The object of this game is to place the sphere through the hoop, hence the name hoopball.” Heatwave corrects them both, noting that it is in fact called basketball. The fact that the writers would harken back to a previous episode here is in itself great. “Space Bots” offers some equally entertaining dialogue between Graham and Doc Greene regarding air sick bags and appetites that is a minor running gag of sorts. And it will have audiences laughing just as much as the back and forth between Heatwave and Boulder about soccer in “The Island Of Misfit Tech.” “I Have Heard The Robots Singing” also presents its own example of what makes the smaller elements of the writing just as important as the stories. This episode is presented as if it was in fact a musical stage production. It even includes a scene in which Dani and the rest of the team are singing a multi-part piece with Dani at the front. The rest of the team shows up behind her in their own separate boxes, which feature just their faces as they sing backup (so to speak) to her. It is a classic element used so many times in real life musicals both on stage and screen. So seeing it used in the case of this episode is sure to put a smile on the faces of those familiar with said element and its use, and even those less familiar with it. It’s just one more way in which the smaller elements of the writing prove so important. There are so many more minor elements that could be cited within each episode. When those elements are set against the elements noted here, and the episodes’ stories, the overall presentation here becomes one that audiences of all ages are bound to love. Shout! Factory is teaming up with Hasbro Studios once again this summer to release yet another installment of episodes from Discovery Family’s hit animated series Transformers Rescue Bots this summer. Transformers Rescue Bots: Heroes of Tech will be released in stores and online on Tuesday, Jun 21st. Levar Burton’s (Reading Rainbow, Star Trek: The Next Generation, Captain Planet and the Planeteers) character Doc Greene gets the spotlight in most of the collection’s episodes. Case in point “One For The Ages.” This Season 2 episode sees Cody turned into an adult by Doc Greene’s stasis machine while Kade has to take over Griffin Rock Emergency while Chief Burns falls ill. In Season 3’s “Too Many Kades” Doc Greene’s Imaging Chamber stars making clones of Kade. Each one has its own personality. This leads to its own share of problems for Cody and the Rescue Bots. Meanwhile Kade learns a valuable lesson about teamwork when gas leak at the Natural Gas Reserve. And in another Season 3 episode, “I have Heard The Robots Singing,” Doc Greene’s inventions cause even more chaos. This time Doc Greene’s Tone-O-Tuner is the culprit. Priscilla Pynch originally got her hands on it in one of her devious plots. But when Huxley Prescott accidentally runs into it with his van, it leads to everyone in Griffin Rock singing everything that they say instead of just speaking. Of course Doc Greene’s tech isn’t the only cause of problems for the people of Griffin Rock. In “The Island of Misfit Tech” (obviously an homage to Rudolph The Red-Nose Reindeer’s Island of Misfit Toys) an out of control mechanical bull sends Cody and the Rescue Bots to the mysterious Island via the “Beam Box.” Even Doc Greene isn’t sure who built the box. As they explore the island, Cody and company discover that it is populated by the world’s most dangerous technology is stored. “Space Bots” is another episode proving that Doc Greene isn’t always at the heart of the Rescue Bots’ adventures. Though, Doc Greene himself is at the center of the episode as he and Graham have to be saved when an experiment with a space elevator called the Asgard goes horribly wrong. It’s up to Cody and the Rescue Bots to save them. To keep up with the latest sports and entertainment news and reviews, go online to http://www.facebook.com/philspicks and “Like” it. Fans can always keep up with the latest sports and entertainment news and reviews in the Phil’s Picks blog at http://philspickw.wordpress.com. Later this month Shout! Factory Kids and Hasbro Studios will release the latest collection of episodes from Discovery Family’s hit animated series Transformers Rescue Bots. The DVD, Transformers Rescue Bots: Adventures in Time and Space is the series’ ninth collection of episodes to be released. And being that a fourth season of the hit series is on the way it obviously is not the last. Would it be nice to see the series’ current three seasons in their own standalone sets? The answer is yes. It has been overseas but not here stateside. Maybe that will eventually happen for American audiences. But in the meantime this latest collection of episodes is still a good addition to the personal DVD library of any of the series’ fans. The main reason for that is the collection’s featured episodes. The writing presented within each of the featured episodes is just as important to note as the episodes themselves. That is because it reaches audiences of all ages in a number of ways that will be discussed later. Rounding out this collection’s overall presentation is once again the work of the series’ voice cast. The cast’s work is impressive yet again. Though, something intriguing happens in one of the episodes that must be noted here. Even with that notable instance, the cast’s work remains just as enjoyable as in episodes featured in the series’ previous DVD collections. Together with the episodes themselves and the writing therein all three elements collectively make Transformers Rescue Bots: Adventures in Time and Space one more collection that any of this series’ fans should have in their own home DVD libraries. Transformers Rescue Bots: Adventures in Time and Space, the ninth collection of episodes from Discovery Family’s hit animated series Transformers Rescue Bots, is yet another welcome addition in the home of any of the series’ fans. The main reason for this is its featured episodes. By and large the episodes featured on this disc were lifted from the series’ third season with one episode—”It’s A Bot Time”—coming from the series’ first season. This is important to note because that episode completes Shout! Factory Kids’ presentation of the series’ first season. The remainder of Season One was spread out across the course of six of the series’ previous eight single-disc compilations. The rest of the episodes featured here all come from Season Three. They are not the only season’s episodes to be presented so far either. Five of Season Three’s twenty-eight total episodes were already presented in the series’ 2015 collection Transformers Rescue Bots: Dino Bots. Keeping this in mind and that of Season Two’s twenty-four episodes only ten have been presented so far, it means that Transformers Rescue Bots: Adventures in Time and Space is hardly the series’ last collection of episodes. That is especially with the announcement last year that the series had been re-upped for a fourth season, which apparently has yet to debut at the time of this review. Staying on that note it would be nice to have all of Season One presented in a single collection for American audiences instead of so many separate single-disc collections. And with any luck Shout! Factory Kids will do just that sooner rather than later. But in the meantime fans of the show will appreciate having said collections and yet another part of the series added into their personal DVD libraries with this latest collection. To that extent even though it is yet another single-disc collection of episodes it is still another important piece for any of the show’s fans until such time arrives. The episodes featured in Shout! Factory Kids and Hasbro Studios’ latest Transformers Rescue Bots DVD are in themselves an important part of the collection’s overall presentation. That is because coupled with the Season Three episodes presented in the 2015 collection Transformers Rescue Bots: Dino Bots they take another proverbial bite out of the series’ third season. Together with the noted collection, nine of Season Three’s twenty-eight total episodes have now been presented on DVD. Fans of the show would likely welcome a standalone, full-season set just as much as this latest collection if not more. So that in mind this collection’s episodes prove to be just as important to the disc’s presentation as anything else in the meantime. As important as the episodes are to the collection’s overall presentation the writing presented within the episodes is just as important as the episodes. This includes both the episodes’ storylines and the smaller elements incorporated into the whole of the stories. “It’s A Bot Time” is the first half of a two-part story arc that closes out Season One. “Bot To The Future” was previously released in a previous TRB (as it will henceforth be known) collection. This portion presents the setup for the story, explaining how Cody and the Rescue Bots ended up in the past and why they had to go back in the first place. Go figure the whole thing was the result of Doc Green’s overly curious mind, not to reveal too much. “Unfinished Business” sees Boulder and Blades head back out into space in order to complete a mission involving an “energy vampire.” Their discovery upon returning to the site of their last encounter with the beast results in quite the outcome. That outcome won’t be revealed here. But it does ultimately leave viewers laughing at least a little bit believe it or not. There’s even a classic body/brain switching storyline in “Switcheroo” that sees the Rescue Bots trading places with their human counterparts after a trip into outer space. It’s an all-too-familiar story line that has been used in countless other sci-fi series animated and otherwise. But even with that familiarity in mind, the writers still manage to keep the story fresh and entertaining here. And even in the Groundhog Day style story “Time After Time” the writers managed to keep that familiar story line fresh in its own right. “The Last Of Morocco” is perhaps the most interesting of the episodes presented in this collection. That is because considering the evil Doctor’s deeds his final fate is not exactly what audiences would expect. It’s one more way in which the stories crafted by the show’s writers show the importance of its writing in regards to the episodes themselves. The writing behind the episodes’ stories is just one important way in which the series’ writing shows its importance in these episodes. The writing within the episodes is just as important as the stories that were crafted for each episode. The stories that were developed for each of the episodes featured in Transformers Rescue Bots: Adventures in Time and Space show in their own way the importance of the writing in the episodes. While they are important in their own right in exhibiting the importance of the series’ writing, the writing within the stories themselves proves to be just as important as the episodes’ stories. That is evident in “Switcheroo.” When the Rescue Bots and the Burns Family head up into space the first time, the writers pay direct tribute to Stanley Kubrick’s 1968 sci-fi masterpiece 2001: A Space Odyssey as Johann Strauss II’s ‘The Beautiful Blue Danube’ plays in the background. The same song is used in one of the movie’s opening scenes as a space station floats in space. In “The Last Of Morocco” the writers don’t just use Jules Verne as a figure for the story. They actually accent his foresight of technology and his desire to use technology for the greater good. What’s more those responsible for the show’s animation even went so far as to use pictures of Verne for the character in the episode in question. That the writers and designers would collaborate and make that happen in this episode shows a great eye for detail. On a completely different note, “Unfinished Business” presents some interesting writing as it opens with a flashback sequence. The catch is that the writers don’t come out and make clear that the opening sequence is in fact a flashback. Audiences are in fact led to believe that they are watching the series’ real first episode. Of course it isn’t. And that ultimate reveal in itself makes for its own share of enjoyment for viewers. The story that follows is just as entertaining with Boulder and Blades hunting down the Energon vampire from the story that they told Cody. The duo’s showdown with the beast and victory both show some great writing, too. That is because the showdown shows Boulder and Blades having to get innovative in order to defeat the beast since it is just the two of them. The outcome presents a setup that all of the anglers out there will appreciate. It’s one more example of what makes the writing within the episodes so important to the DVD’s overall presentation. Each of the noted examples are in their own right important in showing what makes the episodes’ writing so important. The other episodes not directly analyzed here each have their own examples of what makes their writing just as important. Together with the directly noted episodes, the writing within each of this disc’s episodes show clearly and collectively why their writing is so important in the episodes’ presentation. Keeping this in mind, the disc’s featured episodes and their writing show only in part why Shout! Factory Kids and Hasbro Studios’ new Transformers Rescue Bots DVD is a great addition to the personal DVD library of any of the series’ fans. The work of the series’ cast is just as important to these episodes as the writing within. 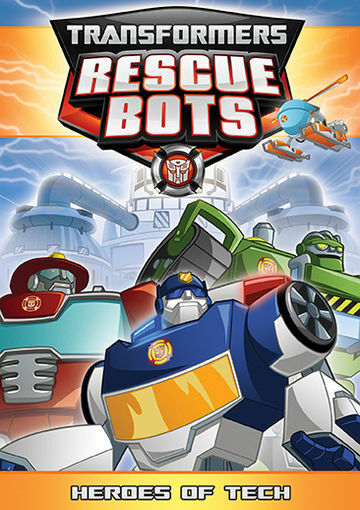 The episodes presented in Transformers Rescue Bots: Adventures in Time and Space and their writing are both equally important in their own right to the DVD’s overall presentation. As important as they are to the whole of the DVD, they are not the DVD’s only notable elements. The work of the series’ voice cast is just as important as the other noted elements. For the most part the voice cast’s work is just as impressive throughout these episodes as in the episodes presented in the series’ previous DVDs. There are a couple of interesting notes that have to be made, though. At first in “Switcheroo” the cast avoids the typical trapping of switching voices when their characters switch bodies. However as the episode progresses that seems to wear off as some of the cast ends up falling into that trap and others not. Even with that happening it doesn’t necessarily detract from the episode. But it does leave one raising one’s eyebrow at times. There is another episode in which Cody’s voice seems to be lower than in previous episodes. This could be attributed to voice actor Elan Garfias either being sick or getting older. Though in other episodes Garfias’ voice sounds completely normal. So it leaves one wondering needless to say. Regardless, Garfias’ performance in said episode is still solid from beginning to end. LeVar Burton is just as entertaining in each episode especially as Doc Green takes more of a direct role in each episode. At times he is so spot on in his role that audiences won’t be able but to laugh at Doc Green in his enthusiasm for what he does. That joy and the entertainment brought from the rest of the cast’s work in these episodes combines to show that the cast’s talent has not dwindled in the least even with the noted anomalies. And together with the displayed work of the series’ writers and those that chose the DVD’s episodes, all three elements come together to make this DVD in whole one more welcome addition to the show’s current series of DVDs. And until or unless the series begins to see its seasons in their own standalone season sets it will be just as welcome in the home DVD library of any of the show’s fans.